Avoid rush-hour crowds. Bicycles can create dangerous situations when they prevent people from moving. For easier trips, use lettered trains. They have bigger stations and roomier subway cars.Choose express trains. These trains have fewer stops, which means there is less boarding and exiting. Enter and exit through station service gate. Swipe your MetroCard, turn the turnstile and enter through the service gate. Do not try to lift your bicycle over the turnstile. Do not carry your bicycle through one of the tall entrances or exits with high steel bars. If you get off at a station where there is only a tall exit with high steel bars, wait for the next train and go to the nearest station that permits easy exit with a bike. High Entrance Turnstile - Don't try to get your bike through here. Board train after passengers exit. This reduces the chance of someone tripping over your bicycle. It also allows you to see if the train is too crowded. Stand near either end of the subway car. Never put your bicycle where it blocks the aisle or doors - you'll create an obstacle. If the only available space is near the door, the train is too crowded. Wait for the next uncrowded train. Stand by your bicycle. Move your bicycle to allow others to pass.If there is a train or station evacuation, you must leave your bicycle behind to ensure a swift and safe exit for all. Make sure all items on the bicycle are secured. Carry your bicycle on staircases. Wait until the staircase is not crowded.Carry your bicycle. And don't bump it on the stairs, because you could lose control. Follow instructions from New York City Police, station and train personnel. To ensure everybody's safety, New York City Police and subway personnel may decide your bicycle is causing a hazardous situation, obstructing passenger movement or interfering with train operations. Be prepared to follow their directions. Courtesy + common sense = bicycle safety. Consideration for others along with reasonable judgment help produce a safer, more comfortable environment for everyone,including bicyclists. We can all breathe easier. Riding a bike, hopping a bus or taking the subway all help reduce pollution in the air we breathe, since it means leaving a car at home. But bicycles can create safety problems in the subway system for both passengers and transit operations. 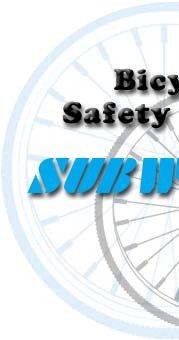 These problems can be easily avoided by following these eight safety tips, observing the rules, and remembering to be considerate of other passengers whenever you take a bicycle into the subway.